What impressed us the most are the facilities provided during our stay, from the day we arrived at the airport to the last day. We requested for private chef to have our dinner cooked everyday and the Thai traditional dishes were way too delicious, much better than eating out ! Car rental was easier and cheaper upon request, everything was exceptional good ! One thing to be aware of is the road entering the villa, it is way too steep and dangerous even when you are walking / driving in and out the villa. Small car / car with worn out tyres could not enter the slopes as it is slippery and you may slide down the road. 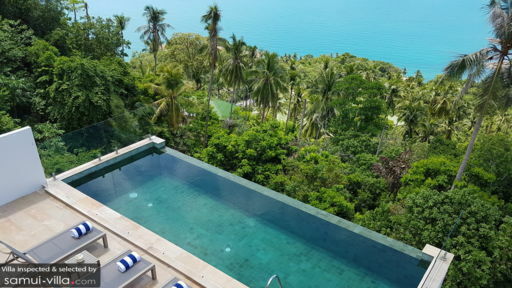 We were a set of 7 friends on a four day trip to Koh Samui and we stayed at the Calvie. The view from the villa is gorgeous, is just so serene. The Villa is well done and in good taste. They have a barbecue set up next to the swimming pool, have a nice terrace to sit an chill on the first floor. The furniture of in the villa is of modern taste and it has all the basic amenities one needs. The only downside to this villa was the access to it. Because its at such a height, the road is just too steep. You cannot ride a bike to this location, most of the taxi guys will not come to this location. Though its just 5 mins from Chaweng, you will need to hire your own car. There is nothing around the villa, you have to go down the hill if you need anything at all. I would total recommend this villa for its view but would strongly advise you to hire a car and take that expense into account. This villa is worth staying in for the view alone. We had such a great stay at The Calvie. 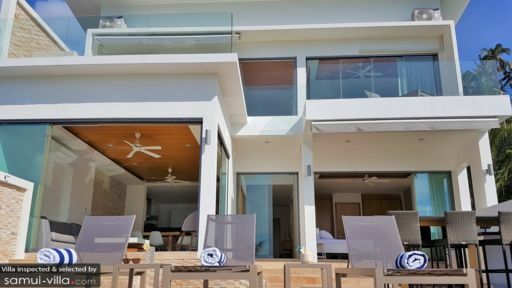 4 Bedrooms all with bathrooms and balconies, plenty of space for everyone in such a beautiful 5 star villa. The villa is a 5 minute drive down the hill from the beach and lots of different restaurants and the housekeeper cooked us a great Thai meal too when we couldn’t be bothered to leave the amazing view and sun lounges. Would happily recommend and stay again, loved it. We stayed at The Calvie for a week in July with our 4 teenagers/20 somethings. It was perfect accommodation for all of us with something for everyone. The villa was so beautiful with amazing views and lots of space. It was spotless and really comfortable-even for 6 adult sized guests. The kids loved having their own bathroom each especially the 15 year old! They were also very happy with the Wifi! The manager Tan was a gem and cooked us some wonderful Thai meals. She couldn't be more helpful with booking activities for us and advice about things to do. We enjoyed Koh Samui so much. Its a perfect size for a short or long break- easy to get around and a great variety of activities for all ages. We went jet skiing, zip lining, explored local markets, went on a boat trip out to Ang Thong national park, ate at great restaurants, and lazed on the beach drinking cocktails. We had some lovely massages by the sea and even had some clothes made. Some days we just relaxed by the pool at The Calvie -beautiful! We flew via Bangkok from Sydney on the way over and via Singapore on the way back. Both options worked quite well although the Singapore option was quicker. 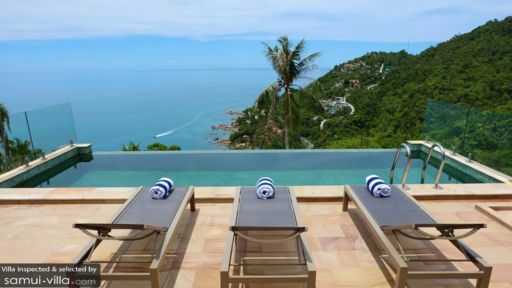 We would definitely recommend The Calvie and Koh Samui for the perfect family holiday for all ages.